﻿ The Society for Georgia Archaeology » What’s in a name? Humans habitually categorize things they think about. This includes objects (consider: animal, vegetable, mineral) and concepts (consider: real versus abstract). Categorization involves priorizing certain characteristics that may be either similar or different. We also categorize time. We talk about timelines, yet we divide them into chunks. Georgia’s archaeology timeline is commonly divided into chunks or segments with names like Mississippian, contact-era, antebellum, and postbellum. Elsewhere on this website we present a brief summary of Georgia’s human past, which includes similarly named time-periods. 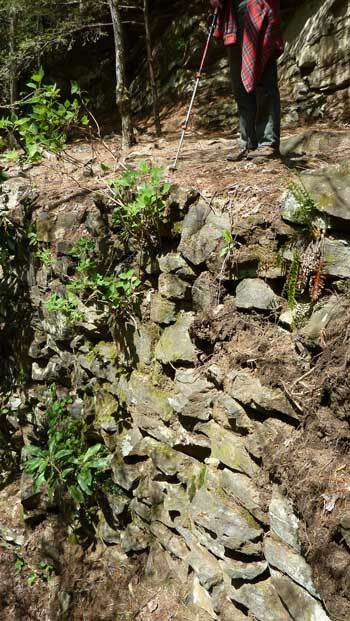 Hiker in a Wilderness Area in northern Georgia standing atop an retaining wall, built for a road or railroad, now supporting a hiking trail. Thus, is this really a Wildernesss Area? This image both illustrates the kind of landscape change the authors mean by Anthropocene, and the human habit of categorizing that landscape…. How these chunks are defined shape how we talk and think about them. The also shape the questions we ask and the research we do. They shape comparisons, and conclusions. Perhaps the degree that they shape them is either minimal or obvious, but, still, they are shaped. Recently, several geologists have proposed that the most recent geological period, the one we’re living in now, should be newly categorized and called the Anthropocene. It can be argued that a formal Anthropocene Epoch would inherently downplay the scale and significance of preindustrial (early agricultural) modification of landscape…and oversimplify the complex and historically protracted human effects on the natural environment. In response, one might say that existing formal boundaries within deep geological time do not typically have such a deleterious scientific effect; more typically the research carried out to establish them illuminates the complex course of palaeoenvironmental history. Regardless, the Anthropocene has taken root in the scientific community, and is now unlikely to decline through practical neglect by working scientists. Do you think it’s a good idea to rename the modern geological epoch to highlight the changes the world is undergoing that are introduced and exacerbated by human behavior? Do you have a comment you want to make? Log in and do so, please!